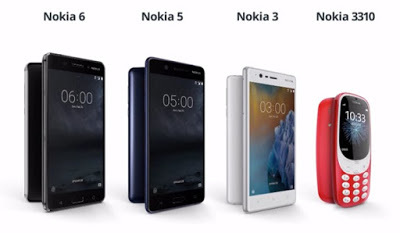 HMD Global at MWC 2017 announced Nokia 3, 5 ,6 and Nokia 3310 Phones. Nokia has confirmed India launch in June Now according to report HMD Global to launch Nokia Phones in India in the first week of June. HMD Global is still undecided on whether to launch all four phones – the Nokia 6, Nokia 5, Nokia 3, and the new Nokia 3310 feature phone – at the same event, or hold separate events. This decision is expected to be taken by May-end. If the company decides to hold separate events, it may launch two of the Nokia phones in the first week of June, while the remaining two will be launched at a later date. Nokia 5 feature a 5.2-inch Display powered by Qualcomm Snapdragon 430 processor with 2GB RAM and 16GB of internal storage on camera it has a 13MP rear cam, 8MP wide angle front cam, and Android 7.1.1 Nougat (with Google Assistant) Fingerprint Scanner on front Packed with a 3000mAh Battery. Nokia 6 feature a 5.5-inch screen with full HD resolution with 2.5D Gorilla Glass. Powered by a Qualcomm Snapdragon 430 processor with 4GB RAM and 64GB storage. The device runs on Android Nougat Out of the box.On camera, it has a 16MP rear camera with LED Flash and 8MP front facing camera.Packed with a 3000mAh Battery. Nokia 6, Nokia 5 and Nokia 3 are expected to be priced between Rs. Rs14,00-16,000, Rs. Rs10,000-13,000 and Rs.8000- 10,000, respectively. The Nokia 3310 (2017) feature phone, on the other hand, is expected to launch in India at roughly Rs. 3500. Better pricing would be 3k, 7k, 11k and 14k respectively for 3310, 3, 5 and Nokia 6, above this these will sit on dealer shelves.